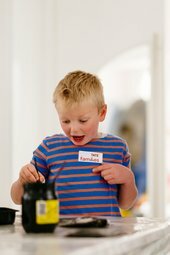 Get creative, investigate art, be messy, play with ideas and explore the galleries at our ‘super’ family takeover day. This Super Sunday is all about dreams! Create your own dream drawings inspired by our new exhibition, put your ideas into our dream mixer and see what comes out, explore the galleries together and enjoy a special animation session bringing your artwork to life with Tough Dough. Free with admission, Locals' Pass and Tate Membership. For families with children under 18. Drop in anytime, no booking necessary.